With just about three weeks left in this year’s Spring/Summer meet, certainly there has been a lot of news swirling in and around Churchill Downs. 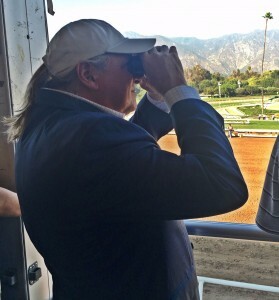 And, much of it has been swiveled by none other than Hall of Fame trainer Bob Baffert. Like he did with American Pharoah three shorts years ago, Baffert has kept his spectacular colt Justify just off Longfield Drive all Spring. Brought him after his impressive victory in the Santa Anita Derby, and has stayed at his new “home” barn at Churchill Downs nearly ever since. Oh, he did make those quick trips. You know, the one up to Baltimore to win the Preakness Stakes at Pimlico, and a wonderful, get-away weekend up to New York for the Belmont Stakes, but as soon as he could line up proper transportation, Baffert would send his stellar steed back to Louisville — along with his trusty sidekick, Sunny, and his best friend, assistant trainer Jimmy Barnes. Now, that Justify has joined the slim ranks of Triple Crown winners, it will be interesting to see how long he will stay in Jefferson County. Word has it that he may travel back to the Left Coast next week some time. But I think he stays long enough to do a little lap around the Churchill Downs oval for the fans to see him before he departs. Maybe this Saturday night, before the Stephen Foster Stakes. #1 Bob Baffert: Despite winning just 2 races out of 13 starts here this spring, the man is “The Man.” By virtue of winning the Kentucky Derby, Baffert still leads the Trainer’s Colony with most purses won. That total currently sits at over $1.552 minion. But his value, public relations, presence in Louisville can’t truly be measured. He has stamped Churchill Downs and its’ racing surface, and accommodations as “The Place To Be” if you want to contend for a Triple Crown. He had the exact same routine with American Pharoah when he pulled the trick for the first time. Now, that he has done it twice, maybe more will take note. This is the place to be to win the Kentucky Derby, obviously. This is the place to be to win the other two races, as well. #2 Brad Cox: Louisville’s own, home-grown trainer has been a bit over-shadowed this meet by his more dappled-out trainer named above, but his accomplishments have been amazing, as well. In 53 starts, he has put up a record of 13-9-7, and he is only behind Baffert in total purses earned this meet. His horses have totaled over $1.184 million to date, and he still has a shot at catching the fair-haired one before the meet ends. But it is Cox’s ascension to the top of the game that has caught attention. Now, perhaps, world-wide. His grand 3-year-old filly, Monomoy Girl, captured the G1 Kentucky Oaks in a grinding stretch duel and despite the fact that she broke from the far outside #14 post position. This past weekend, she returned to glory, once again, winning the G1 Acorn at Belmont Park on the spectacular “undercard.” Cox won the Trainer’s Title at the Fair Grounds this winter. He may not be able to win enough races to do that here. But he may end up winning the most purses for the meet. #3 Steve Asmussen: Like Baffert, this Hall of Fame trainer keeps his best here at Churchill Downs nearly year-round, as well. He did the same with the great Gun Runner a year ago. And, he has kept most of his top runners here all Spring & Summer. Currently he is leading the Trainer’s Title with 19 wins, which gives him a 5-win advantage of Kenny McPeek. To date, Asmussen has put up a record of 19-10-9 in 71 starts this meet. His win percentage is a lofty .27%, and his horses have finished on the board .54% of the time. He, too, is a PR masterpiece for the reputation that Churchill Downs has become the best place in the world to train and run your horses.